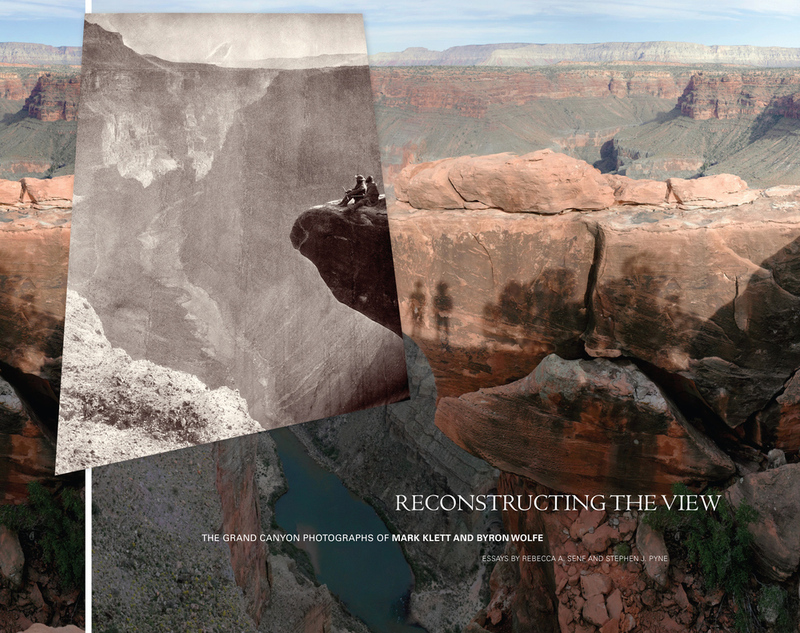 We are pleased to announce the publication of Reconstructing the View: The Grand Canyon Photographs of Mark Klett and Byron Wolfe. Reconstructing the View: The Grand Canyon Photographs of Mark Klett and Byron Wolfe began in 2007 and concluded in 2011. There is a book publication (see posting above) and a touring exhibition will begin in 2013. Please contact us for details. 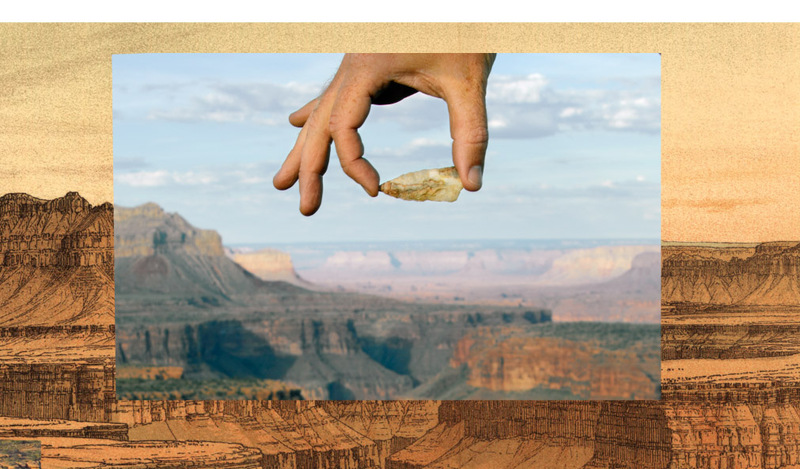 For a more thorough description of the work, please see this brochure produced by The Phoenix Art Museum and the Center for Creative Photography. Here is a brief video that describes our approach to making this rephotographic panorama. Mark Klett and Byron Wolfe, 2007. 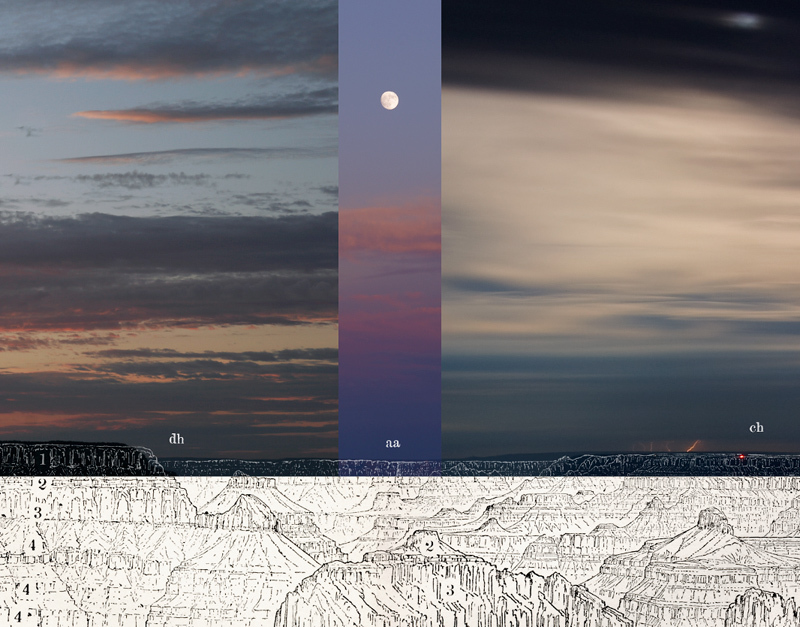 Details from the view at Point Sublime on the north rim of the Grand Canyon, based on the panoramic drawing by William Holmes (1882). Mark Klett and Byron Wolfe, 2008. 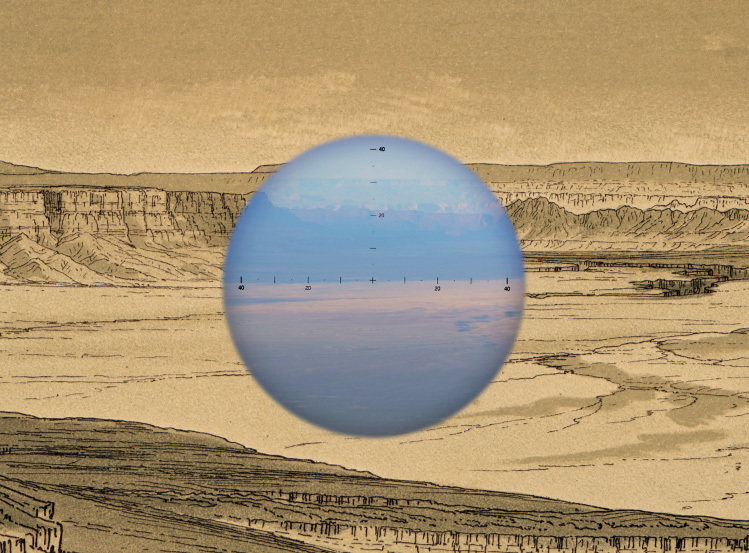 Key to the Panorama from Point Sublime (with a rough accounting of the parts of a day and some heavenly phenomena), based on the panoramic drawing by William Henry Holmes (1882). William Henry Holmes, 1882. Key to the Panorama form Point Sublime, Looking East, South and West. From Clarence Dutton, The Tertiary History of the Grand Cañon District. (Courtesy Library of Congress). Detail one, two, and three. 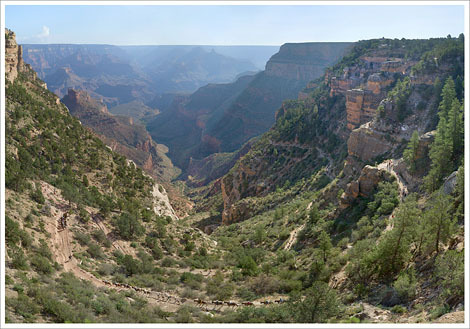 Mark Klett and Byron Wolfe, 2007. One hundred and five years of photographs and seventeen million years of landscapes; Panorama from Yavapai Point on the Grand Canyon connecting photographs by Ansel Adams, Alvin Langdon Coburn, and the Detroit Publishing Company. 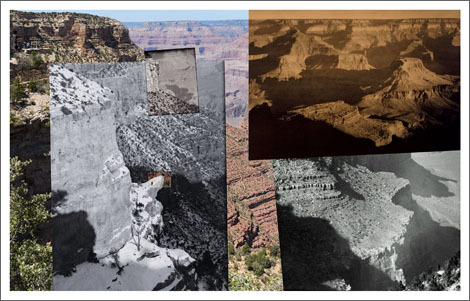 Mark Klett and Byron Wolfe, 2007. 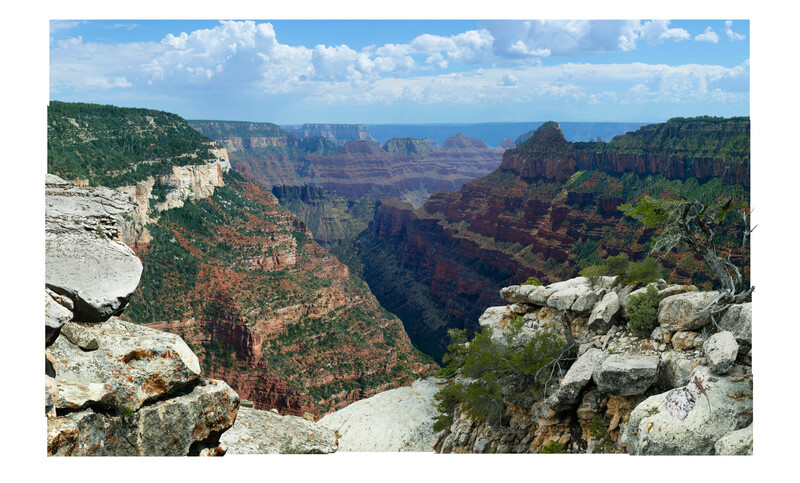 Panorama from Hopi Point on the Grand Canyon, made over two days extending the view of Ansel Adams. 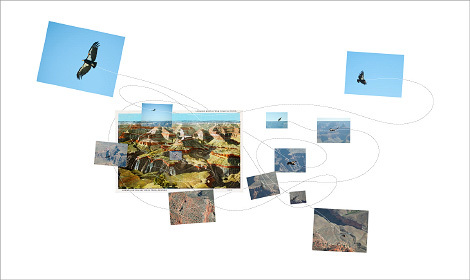 Here is a brief video that describes the process for creating the Hopi Point panorama. Medium: Digital inkjet print. 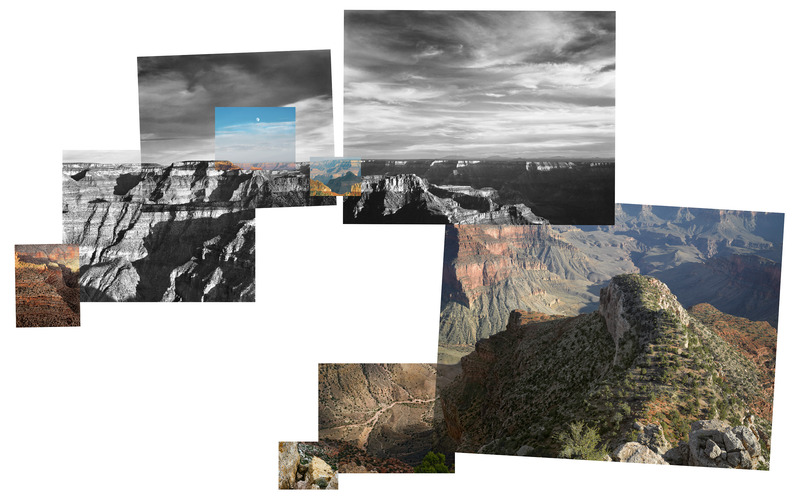 Dimensions: six individual panels at 24"h x 18"w plus one at 24"h x 33.5"w.
Mark Klett and Byron Wolfe, 2008. Confirming the details of the moment across the geologic horizon of Marble Canyon. 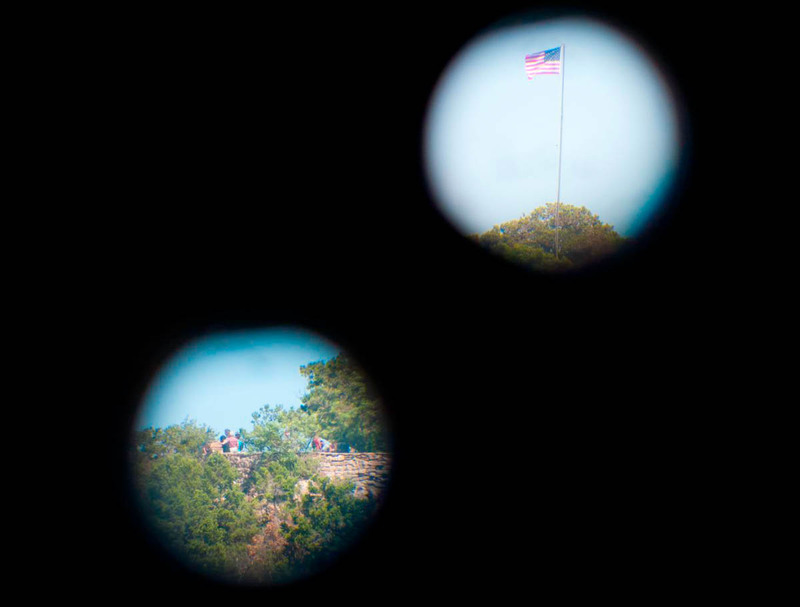 Views from a military spotting scope on the Platform where William Holmes drew the eastern edge of the Kaibab (1882). Lithograph by William Henry Holmes, 1882. Sheet XIX, Views form the Marble Cañon Platform from the Eastern Brink of the Kaibab. From Clarence Dutton, Atlas to Accompany the Monograph on the Tertiary History of the Grand Cañon District. (Courtesy of the Library of Congress). Mark Klett and Byron Wolfe, 2008. 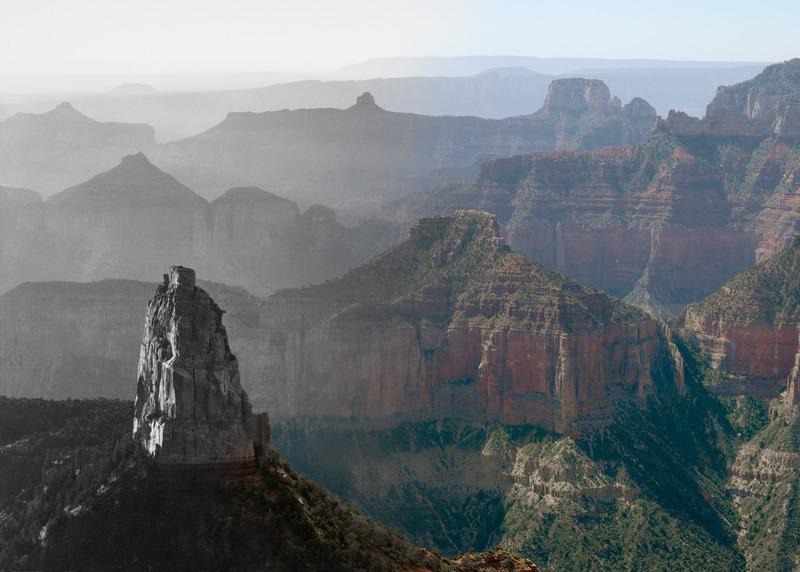 August sunrise (left) and June sunset (right) near Mather Point. Medium: Digital inkjet print. Details one, two, and three. Mark Klett and Byron Wolfe, 2009. 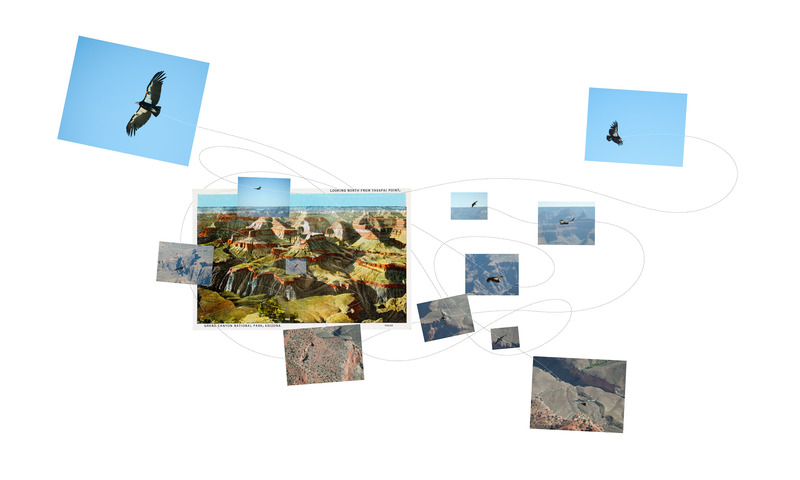 A map of flight for California Condors #4 and #99 above Yavapai Point. Inset: Photographer Unknown, nd. Postcard. Mark Klett and Byron Wolfe, 2008. Buttes of the Moenkopi Formation near Lee's Ferry, Arizona. Mark Klett and Byron Wolfe, 2007. 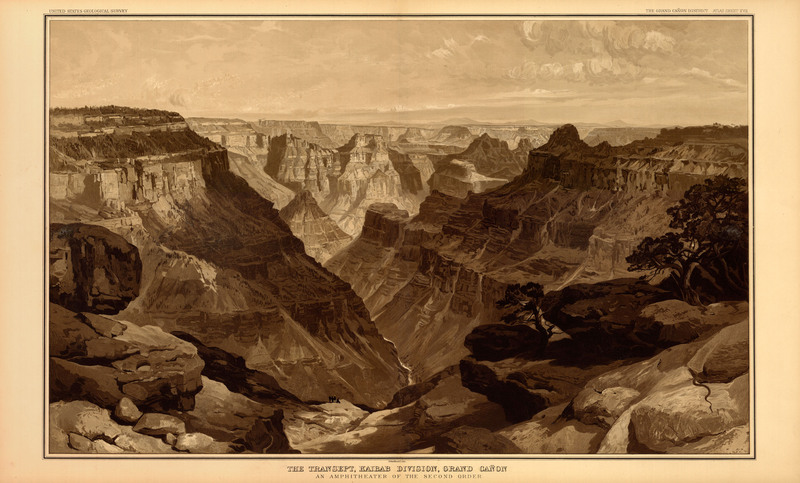 View from the south rim of the Grand Canyon with Thomas Moran and California Condor number 302. Right: Photographer unknown, ca 1907. Thomas Moran, America’s greatest scenic artist sketching at Bright Angel Cove, Arizona. (Half of stereo view) Keystone-Mast Collection, California Museum of Photography, Riverside. Here's a brief video that describes the discoveries that are often made when investigating historic photographs. Mark Klett and Byron Wolfe, 2008. View down river from Toroweap Point, with rafters approaching Lava Falls. Mark Klett and Byron Wolfe, 2007. 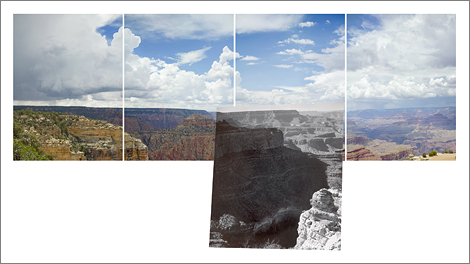 Sixty-six years after Edward Weston’s “Storm, Arizona” From the Marble Canyon Trading Post. 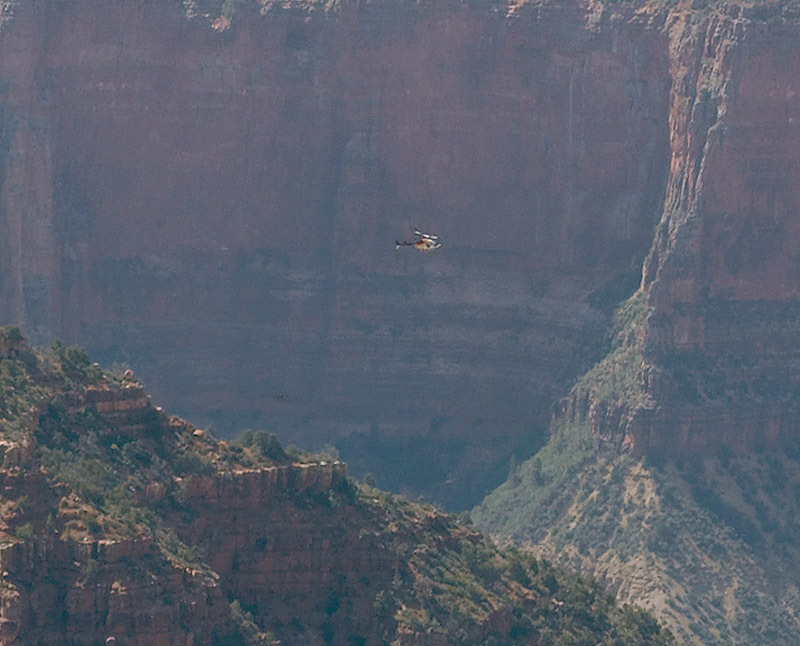 Mark Klett and Byron Wolfe, 2010. "My brother in Phoenix died." A video response to a found postcard. From the South Rim of the Grand Canyon, Arizona. Best when viewed on an iPad. Medium: Digital video. Dimensions = 6”h x 7.75”w. Mark Klett and Byron Wolfe, 2008. Descending into the canyon, mid-morning on the trail at Bright Angel. Composited from fifty-six different pictures made over twenty-five minutes. Mark Klett and Byron Wolfe, 2008. People on the edge. All: Photographers unknown, nd. 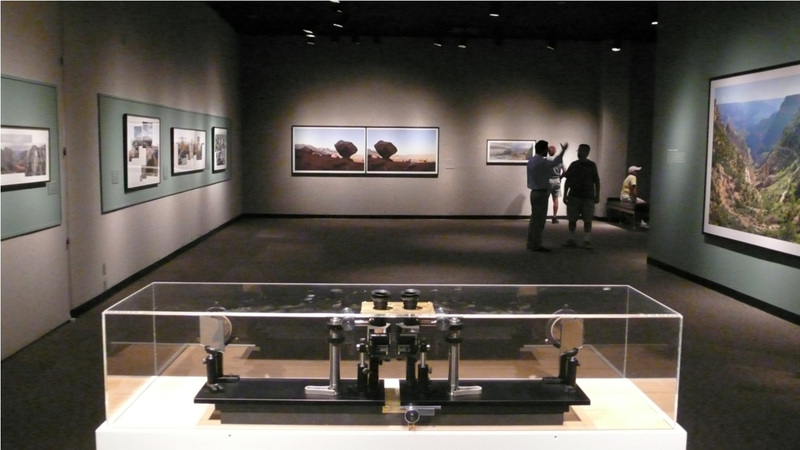 Stereo views from the Keystone-Mast Collection, California Museum of Photography, Riverside. Mark Klett and Byron Wolfe, 2008. Man peering into space. Bottom Left: Photographer unknown, ND. (Half of stereo view) Keystone-Mast Collection, California Museum of Photography, Riverside. Mark Klett and Byron Wolfe, 2008. 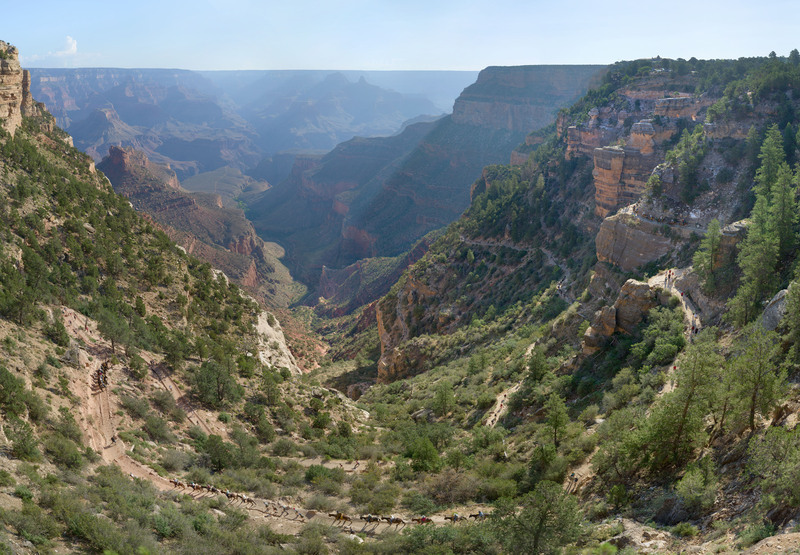 At the Canyon's edge: from the foot of the Toroweap to the "Devil's Anvil" overhang with an upstream view of the Colorado River. Mark Klett and Byron Wolfe, 2008. Point Imperial on the Grand Canyon, 50% Ansel Adams, 50% Red Wall Limestone. Mark Klett and Byron Wolfe, 2008. Moonrise above Point Sublime. Mark Klett and Byron Wolfe, 2008. 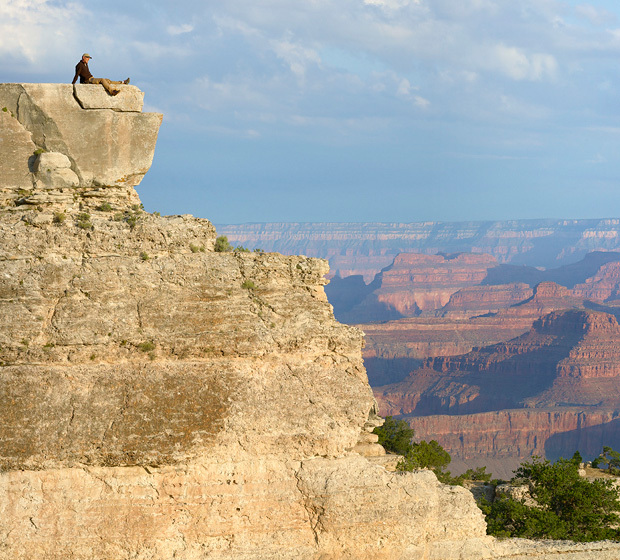 Overlooking the south rim, east of Bright Angel Canyon. Mark Klett and Byron Wolfe, 2008. 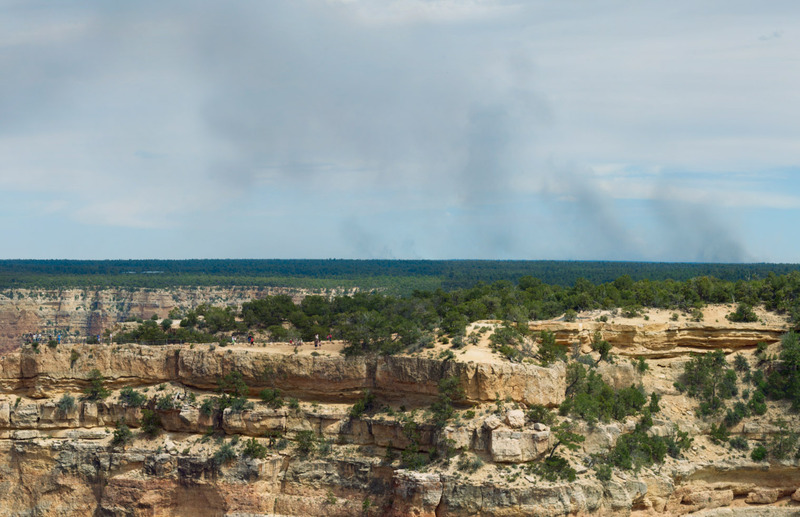 Lightning fire and smoke above the south rim, view from the Powell Memorial. Mark Klett and Byron Wolfe, 2008. 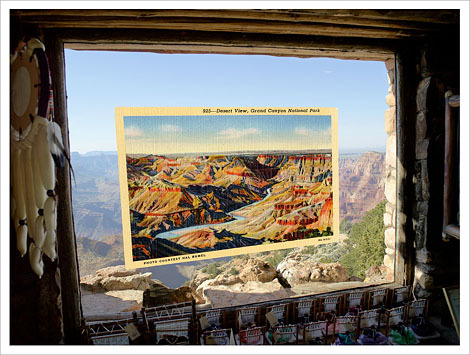 Reconstructing the view from the El Tovar to Yavapai Point using nineteen postcards. Mark Klett and Byron Wolfe, 2008. Site of a dangerous leap, now overgrown. 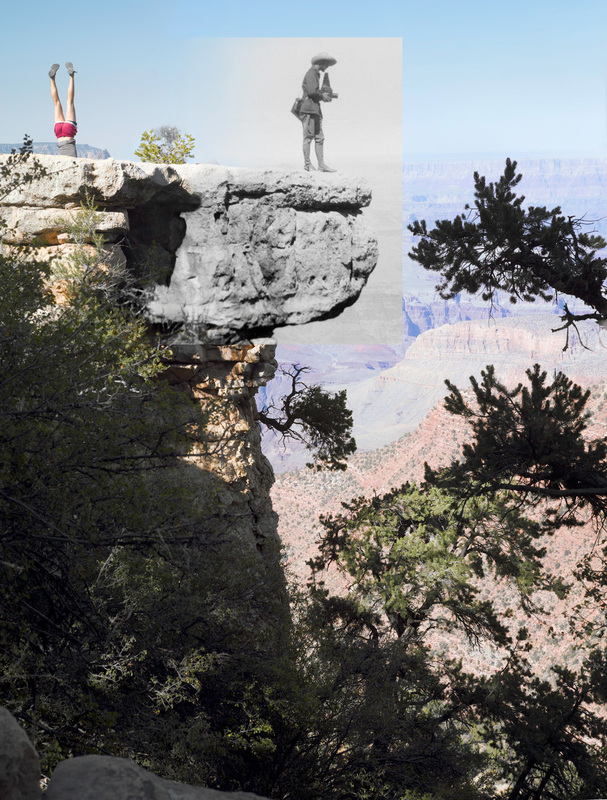 Mark Klett and Byron Wolfe, 2011. 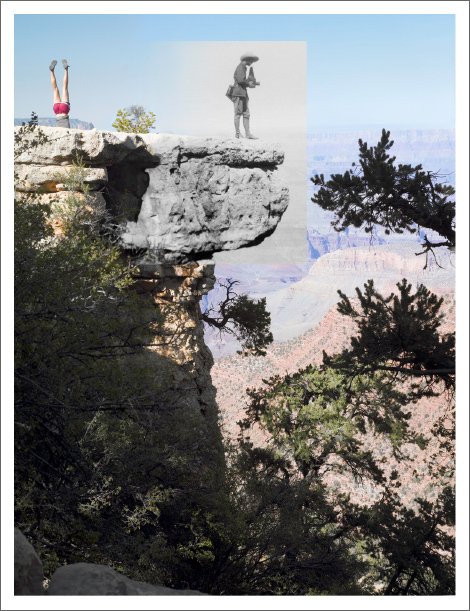 Woman viewing the canyon among Twentieth Century visions of Pictorialism, Modernism, and Tourism. From left to right: Photographer unknown, postcard (detail) ca mid-twentieth century. Ansel Adams, Grand Canyon National Park, Arizona 1941 (Courtesy National Archives Washington DC). (Below) Photographer unknown, postcard (detail) ca mid-twentieth century. George Eastman House, Rochester, NY). Photographer unknown, postcard (detail) ca mid-twentieth century. O¹Neil Point, 1902. (Courtesy of the Library of Congress, Washington DC). Mark Klett and Byron Wolfe, 2008. At the Head of the Tuweep Valley: Over 180° across three panoramas – plus an antler, an arrowhead, and three hikes up the Vulcan’s Throne. Close-up of full left panel and detail. Close-up of full middle panel and detail. Close-up of full right panel and detail. Left: William Bell, 1872. Grand Canyon, Colorado River, Arizona. Six Albumen Photographs. Courtesy Smart Museum of Art, University of Chicago. Mark Klett and Byron Wolfe, 2008. 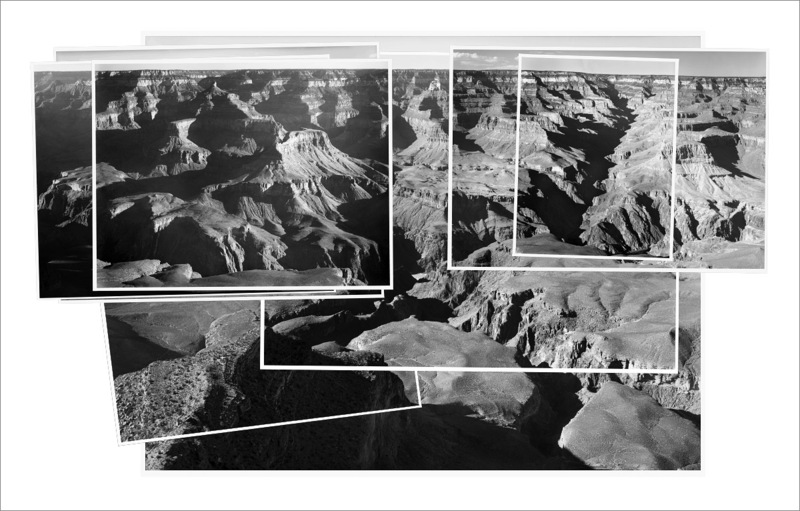 Combined record of Ansel Adams' photographs made over the course of an entire day, Yavapai Point. 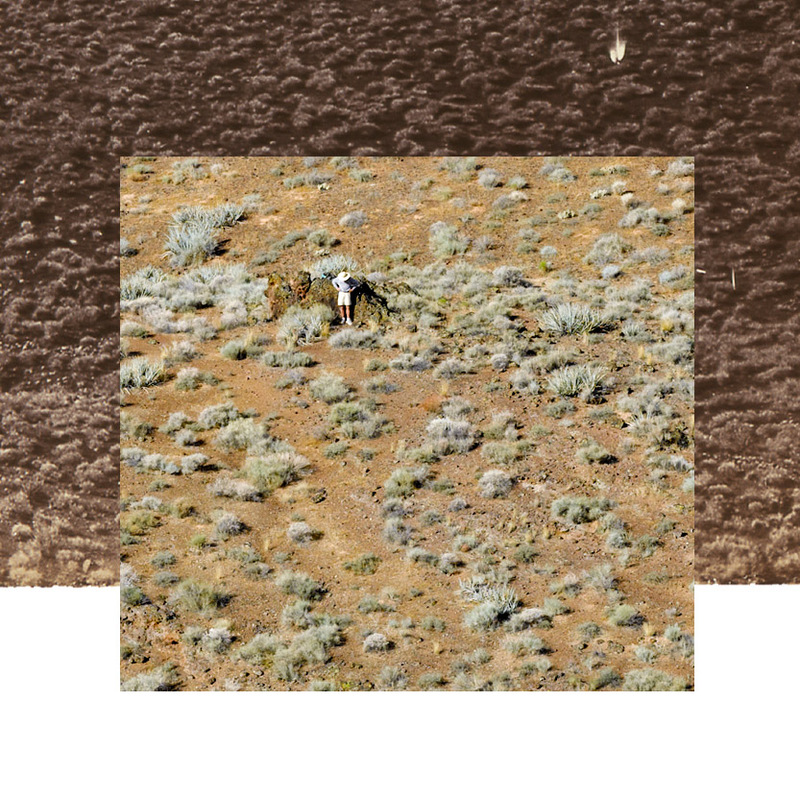 Mark Klett and Byron Wolfe, 2010. 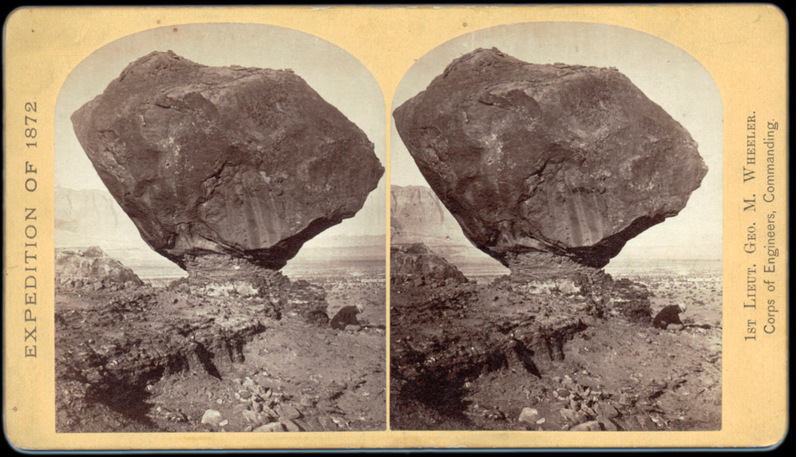 A walk around the "Perched Rock," starting and ending with an 1872 picture by William Bell, Lee's Ferry, Arizona. 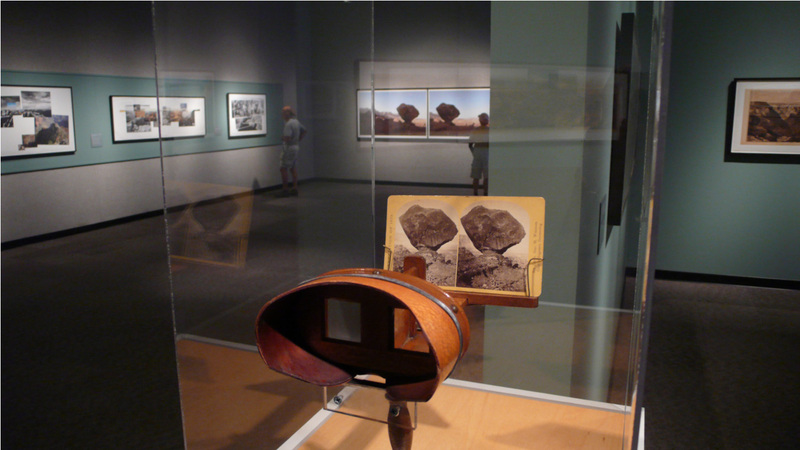 Installation view showing the custom-built oversized stereo viewer, William Bell's original stereo and the card on display. 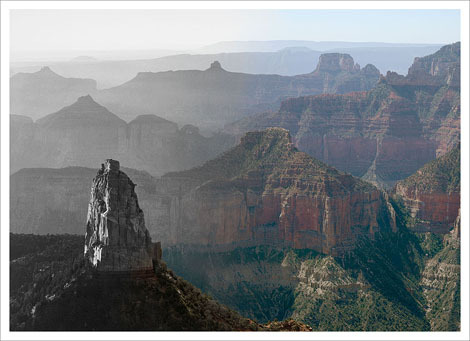 Mark Klett and Byron Wolfe, 2010. A walk through William Bell's "Perched Rock," Lee's Ferry, Arizona. 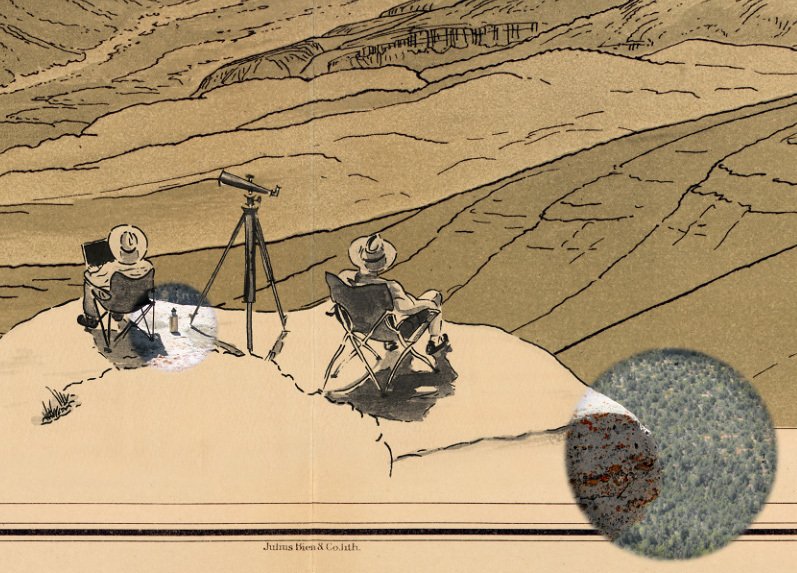 A composite stereoscopic image using parts of the scene from 2010 combined with a USGS Survey Expedition stereo card, 1872. Best when viewed with a Holmes/iPad stereoscopic viewer. Mark Klett and Byron Wolfe, 2008. Piecing together "The Transept" with fifteen different pictures from five separate locations distributed across a half a mile. Here's a link to the original Holmes and Moran image. This is a brief video that animates the reconstruction using photographs. Mark Klett and Byron Wolfe, 2007. Fire on the south rim connecting Ansel Adams' photographs made along the Grand Canyon Lodge North Rim waking trail. Mark Klett and Byron Wolfe, 2009. $1.00 worth of scenery (every picture made by putting four quarters in a pay-per-view telescope). Mark Klett and Byron Wolfe, 2007. 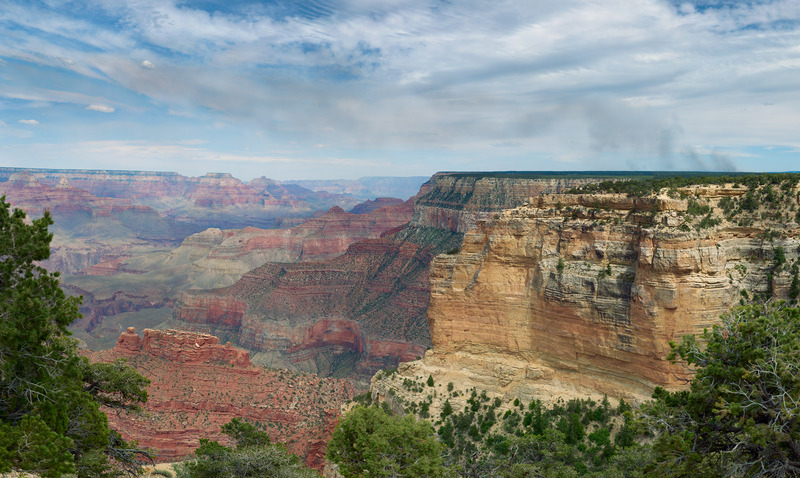 Panorama from Moran Point showing Ansel Adams' late afternoon view of the Grand Canyon. Mark Klett and Byron Wolfe, 2009. Alvin Langdon Coburn’s storm passing through three seasons and ninety-eight years (1911, 2007, and 2009). Mark Klett and Byron Wolfe, 2009. 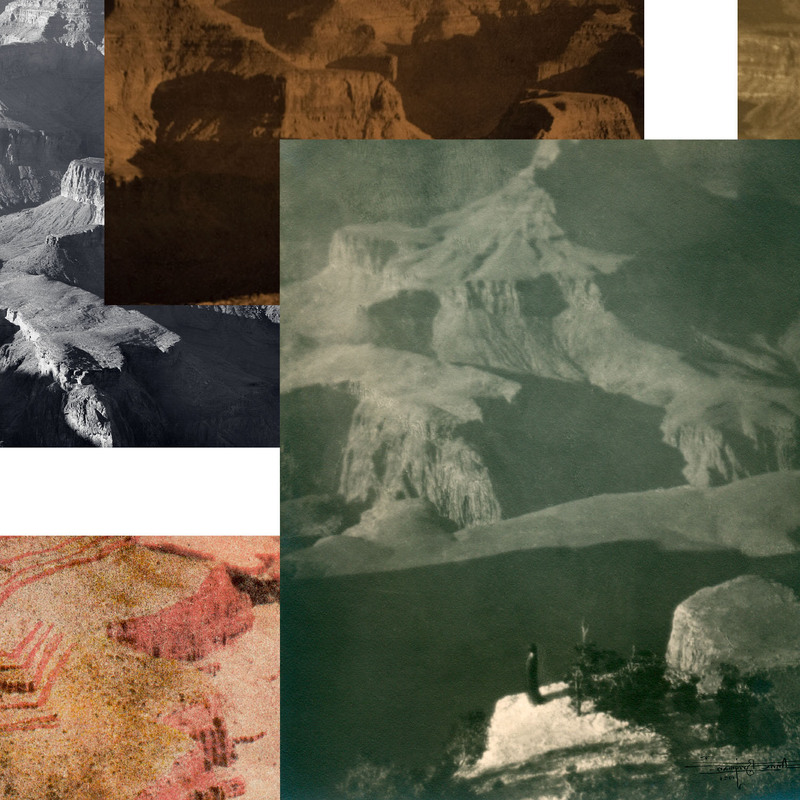 Rectilinear composition of the south rim made from six photographs, four by Alvin Langdon Coburn, ca. 1911. Mark Klett and Byron Wolfe, 2009. Woman on head and photographer with camera; unknown dancer and Alvin Langdon Coburn at Grand View Point. Mark Klett and Byron Wolfe, 2009. 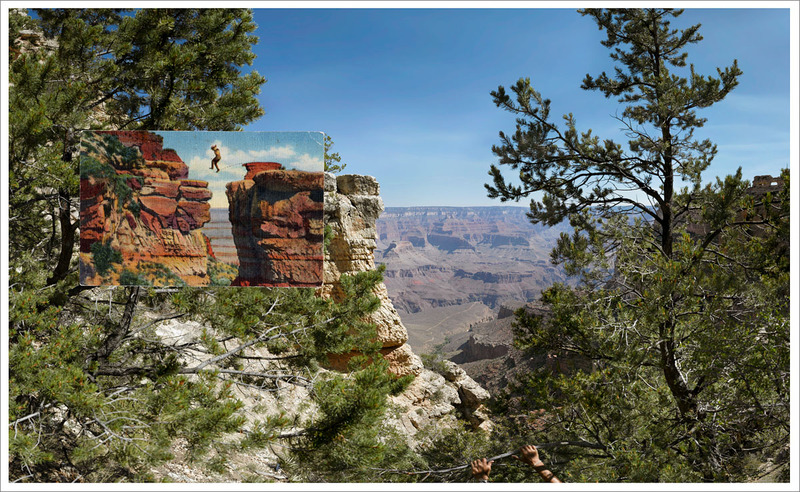 Viewing the spectacle; the Sinking Ship on the South Rim with Buffalo Bill making a toast. Top insets (viewing figures): Photographers unknown, ND, selections from half of stereo views (Courtesy of the Keystone-Mast Collection, California Museum of Photography, Riverside). Bottom left inset: Photographer unknown, 1893. 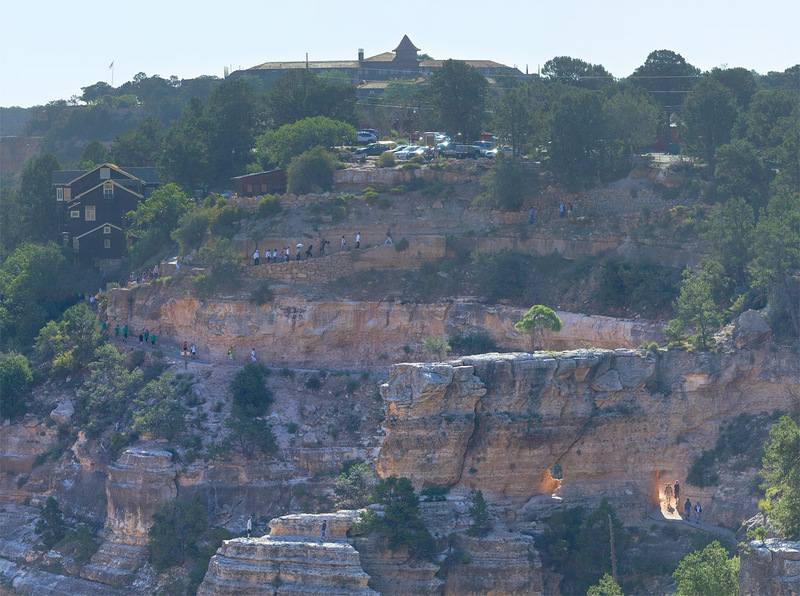 Buffalo Bill and Party at Point Sublime, Grand Cañon of the Colorado. Half-tone print from Pioneer America (artist's collection). Bottom right inset: Chromolithograph postcard, Detroit Publishing Company (William Henry Jackson), 1898. 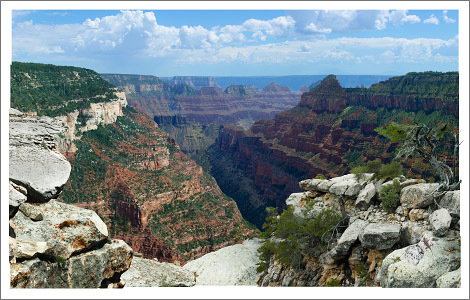 Arizona, Grand Canyon of Arizona. (Courtesy Brigham Young University). Mark Klett and Byron Wolfe, 2009. Bridging the gap between two views, upstream and downstream, Soap Creek, Marble Canyon. 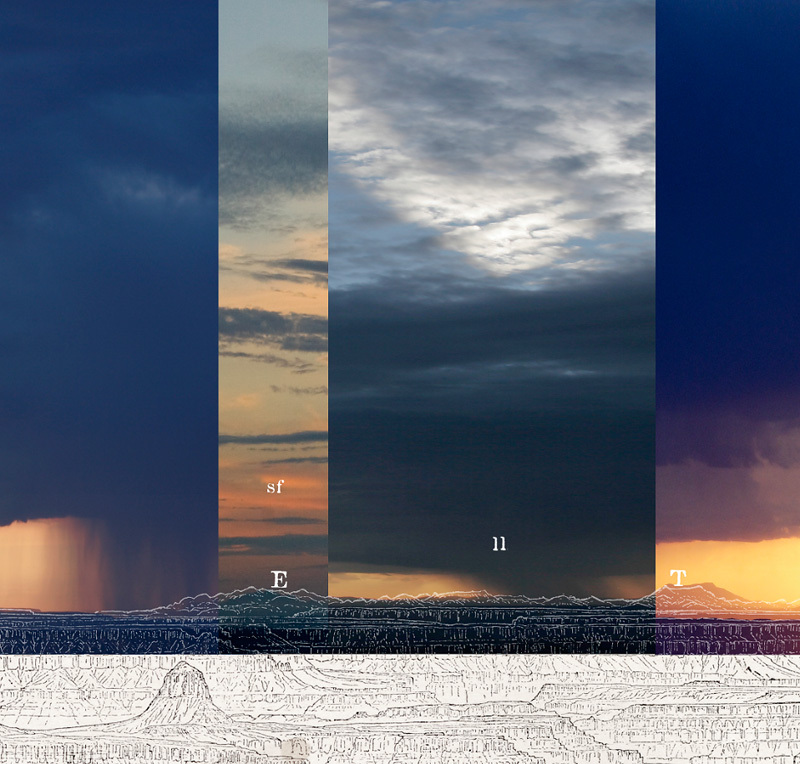 Four separately framed photographic images. Left: William Bell, 1872. Grand Cañon, Colorado River, Near Paria Creek, Looking East. Vintage albumen photograph on War Department mount, Wheeler Survey of the 100th Meridian. Size: 21.5" x 16.75" (mount), 11" x 8" (image). Right: William Bell, 1872. Grand Cañon, Colorado River, Near Paria Creek, Looking West. Vintage albumen photograph on War Department mount, Wheeler Survey of the 100th Meridian. Size: 21.5" x 16.75" (mount), 10.75" x 8" (image). Mark Klett and Byron Wolfe, 2009. Observing the view east from Dutton Point in stereo. Back: J. K. Hillers, 1872. Size: 8.5” x 18” (combined images). (Courtesy National Archives). Overlay: Klett and Wolfe, 2009. Standing on the edge of Dutton Point. 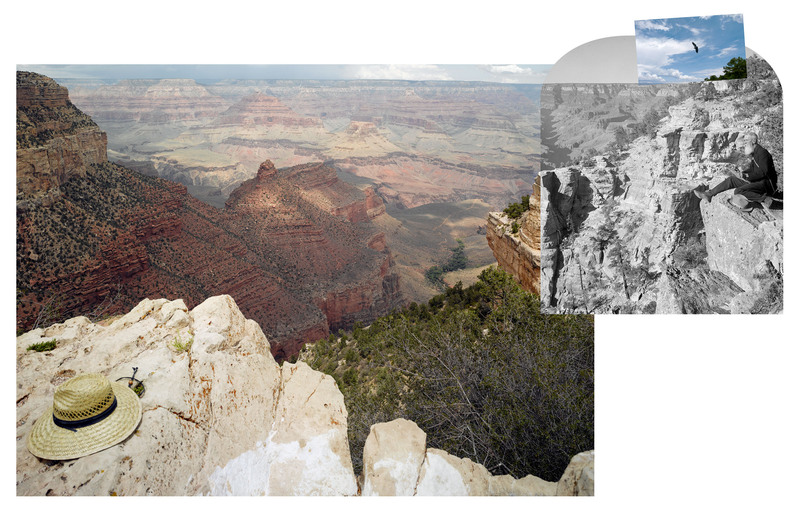 Dimensions of each overlay image = 4.5" x 3.5"
Mark Klett and Byron Wolfe, 2010. Arthur Wesley Dow, on the edge at Hopi Point, photographed by Alvin Langdon Coburn in 1911. Right image: Alvin Langdon Coburn, 1911. 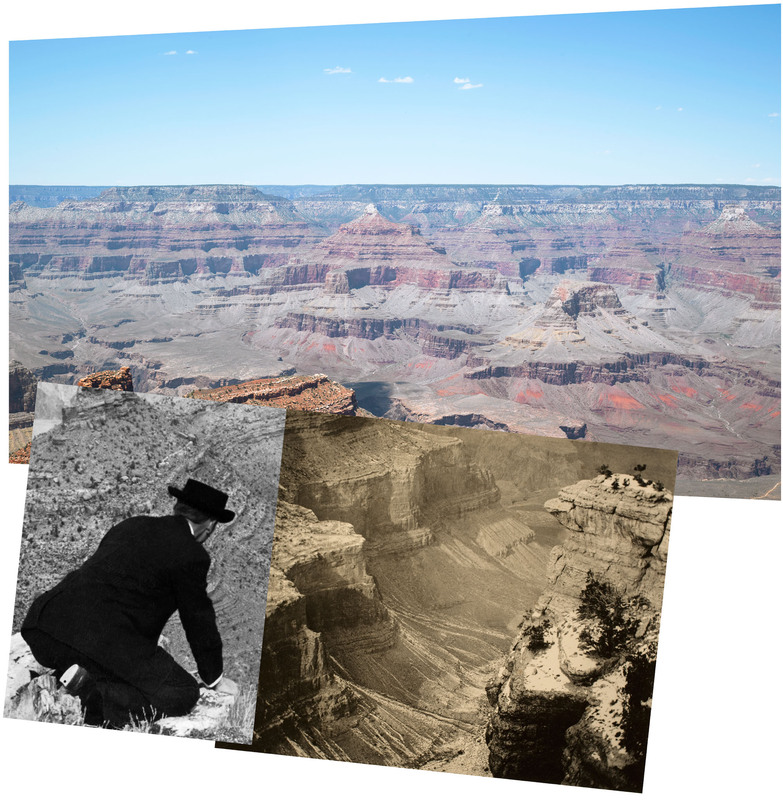 Arthur Wesley Dow at Grand Canyon. (Courtesy of the George Eastman House, Rochester, NY). 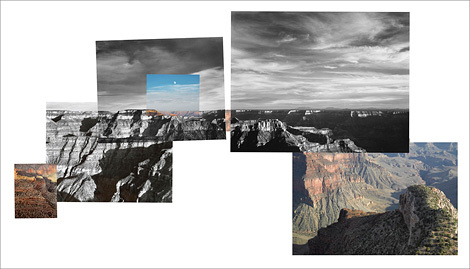 Mark Klett and Byron Wolfe, 2010. 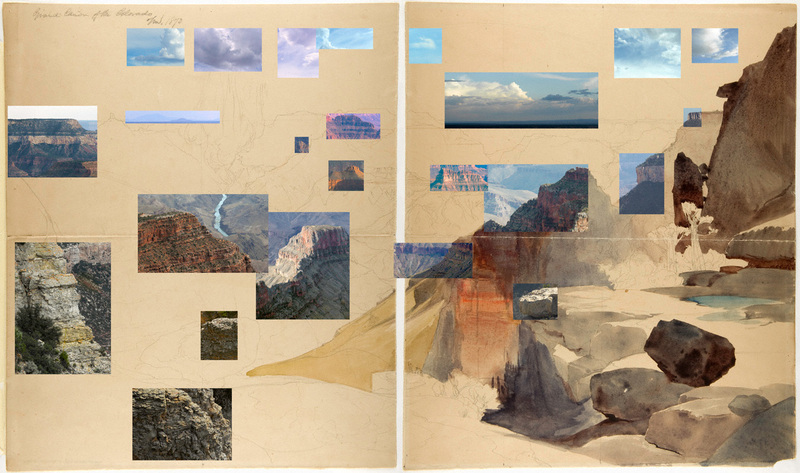 All that matched the view of Thomas Moran's sketch "Grand Cañon of the Colorado"with pieces from Dutton Point, Muav Saddle, and Swamp Point. Back: Thomas Moran, 1873. 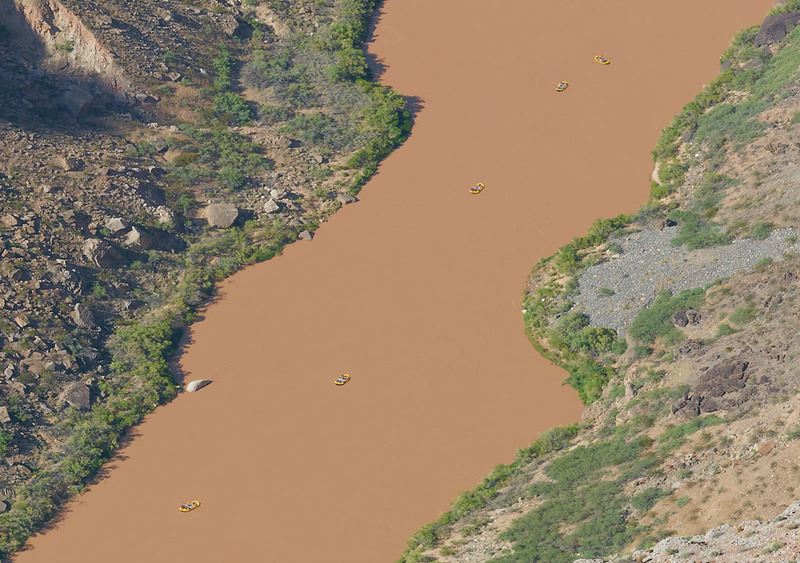 Grand Cañon of the Colorado. (Courtesy of the Gilcrease Museum, Tulsa, Oklahoma). 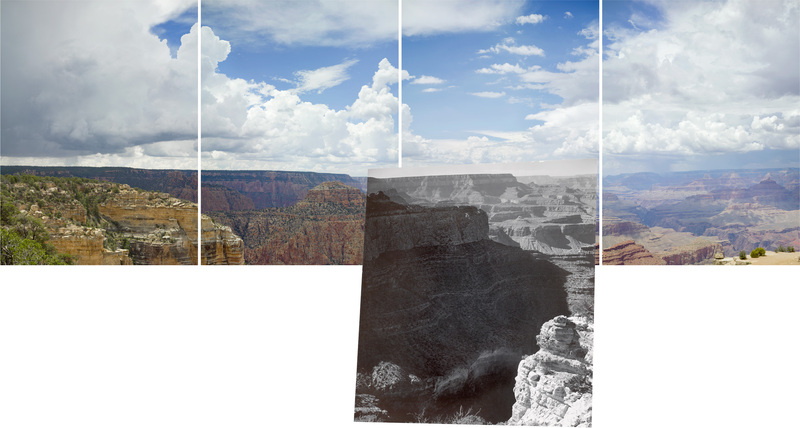 Mark Klett and Byron Wolfe, 2010. 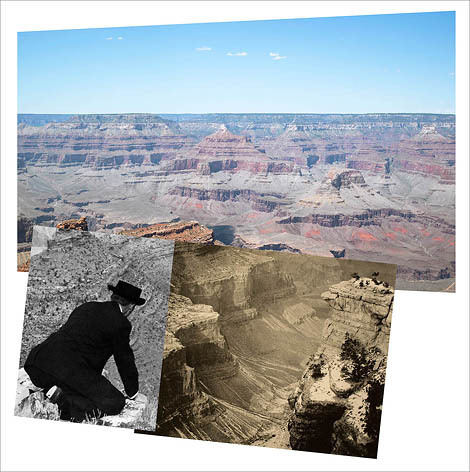 Placing pieces of Thomas Moran's sketch "Grand Cañon of the Colorado" over the panoramic view from Dutton Point with part of the first photograph ever made from this remote location. Inset: Thomas Moran, 1873. Grand Cañon of the Colorado. (Courtesy of the Gilcrease Museum, Tulsa, Oklahoma). And J. K. Hillers, 1872. 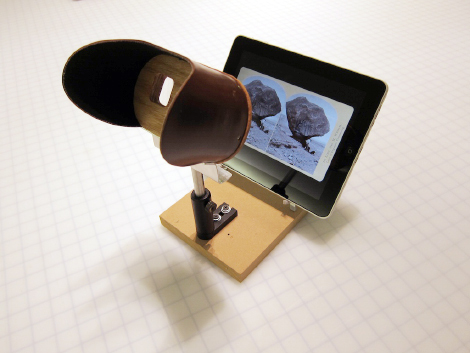 Part of a stereo view. (Courtesy National Archives). 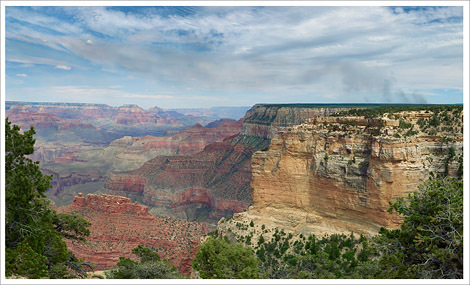 Mark Klett and Byron Wolfe, 2010. Scanning the other side, across the chasm from rim to rim. Far left image: Photographer unknown, nd. Half of a stereo view from the Keystone-Mast Collection, California Museum of Photography, Riverside. Far right image: A. J. Baker, 1922. 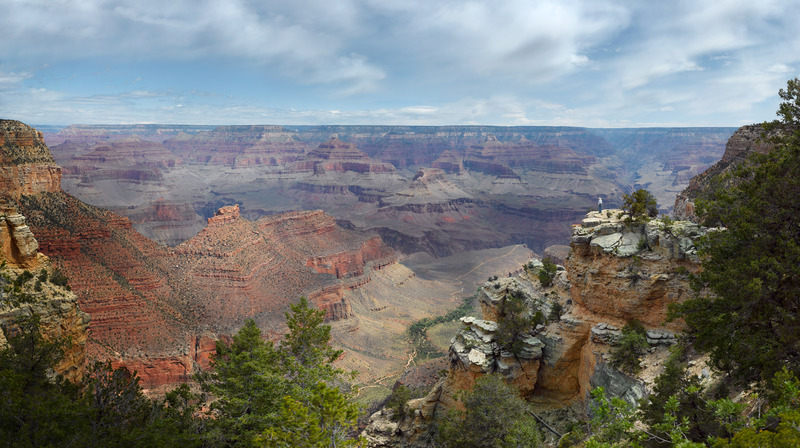 The Grand Canyon, Arizona, from Bright Angel Point. Courtesy of the Library of Congress. 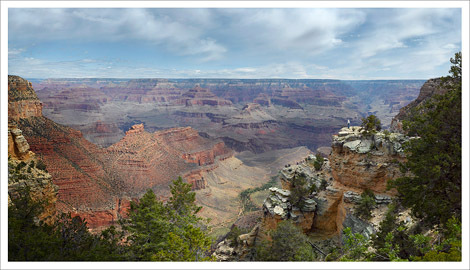 Mark Klett and Byron Wolfe, 2010. 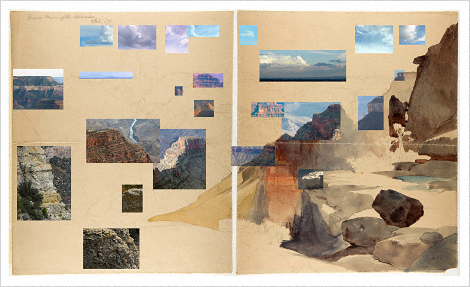 Connecting the pieces of William Bell's panorama of the Lonely Dell Ranch where the Paria and Colorado Rivers join at Lee's Ferry. Overlay: Wm Bell, 1872. Side of Canyon and junction of Paria and Colorado Rivers. Size: 8.5” x 18” (combined images). (Courtesy National Archives). 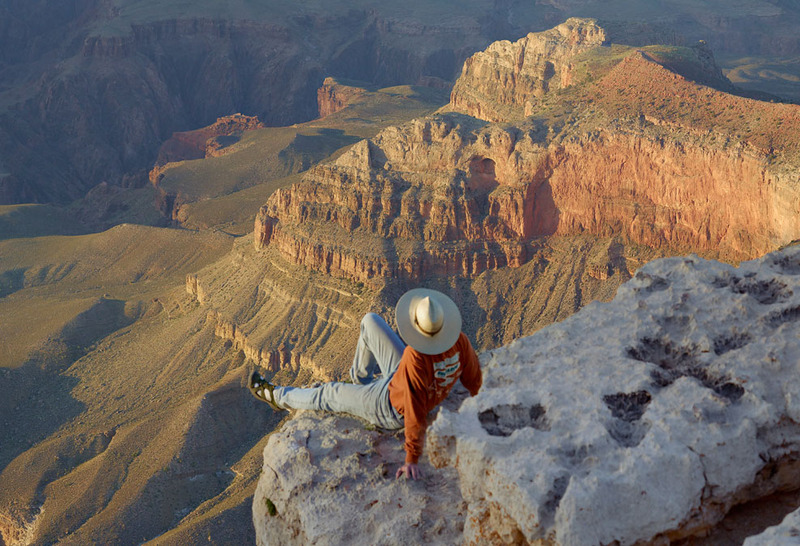 Mark Klett and Byron Wolfe, 2010. 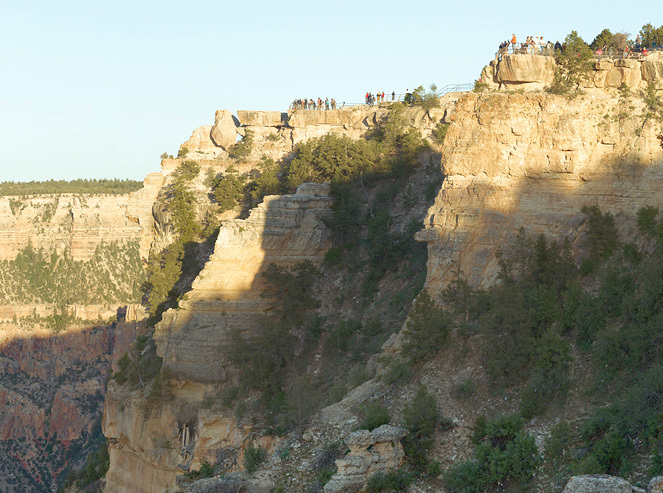 At the canyon's edge: figures on "The Devil's Anvil" overhang, 3000 feet above the Colorado River. Overlay: William Bell, 1872. Devil's Anvil, Sheavwitz Crossing Near Foot of Toroweap Valley, River 3000 Feet Below, Colorado River. 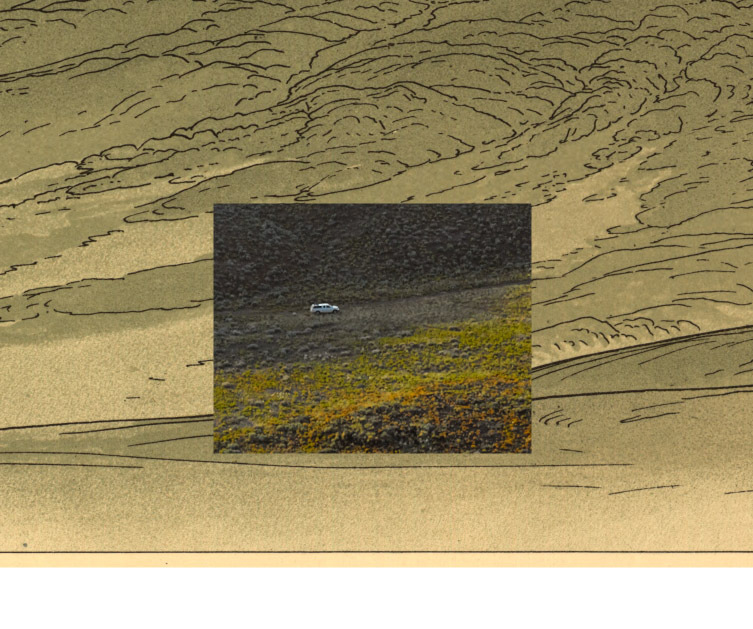 Dimensions of each image = approximately 5" x 6". (Courtesy National Archives). Mark Klett and Byron Wolfe, 2010. Overlooking rafters on the Colorado River. Above Marble Canyon near Lee's Ferry, Arizona. Overlay: Wm Bell, 1872. 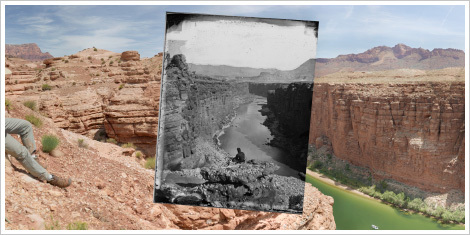 Grand Canyon of the Colorado, Colorado River (half of a stereo card, Courtesy National Archives).